Wow, it seems like forever since I wrote anything here! I am going to try to be better about posting now that things have gotten a little calmer here (that statement was probably the kiss of death)! We visited the illustrator's parents last weekend and had a very relaxing time. We all needed the time with them to just hang out and not worry about anything. The two of them always take care of all of us and even as an adult...that feels nice! They live on the lake in a small town in Tennessee and it was just beautiful this time of year! While were out walking around, my father-in-law showed me a tomato plant that they have next to their house. Now, this would not be an interesting thing other than the fact that he did not plant it there and it is the biggest tomato plant any of us had ever seen! The base was a little over 2 inches thick and the plant had grown to around 4 feet wide! It has so many tomatoes growing on it that I had to ask for a couple of green ones! 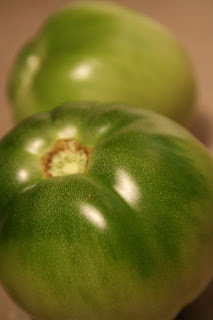 I have not had fried green tomatoes in so long and I really wanted to play with some of these beauties. Now, you know I have to make a healthy spin on them (and I really don't like the flavor of fried food). So, I experimented with baking them. The process was perfect. I used cornmeal this time, but next time I will use bread crumbs (maybe panko). They were really good, but I think they could have been better. I will definitely be playing with this one (at least when I can get my hands on more green tomatoes)! Preheat oven to 400 degrees. Spray sheet pan with cooking spray. Combine corn meal mix with salt and pepper in a shallow bowl. Dip tomato slices in milk and then in cornmeal mixture. Spray the tomato slices with cooking spray. Bake at 400 degrees for 15 minutes. Then, turn the slices over and lightly spray with cooking spray. 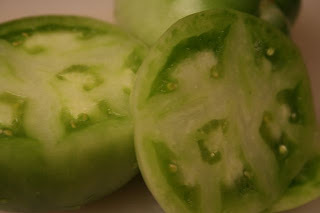 I can't say that I've ever eaten a green tomato, but I certainly have heard of the infamous fried-green tomato recipe (it's even the title of a movie! haha). looks good! Wow! I love all things tomato and these look great! I'm avoiding fried food for awhile after last night's chicken-fried bacon debacle. 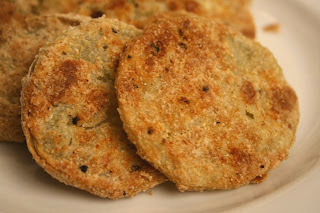 Veggie Girl-They are so good! The movie and the real thing are great! I love them both! Peeree3-I am appalled by what the two of you did to yourselves last night! I have told you about recipes from Tony...I am just glad that Cat was nearby to take care of you if you had a heart attack! Cat, these really were good! You would love them! Maybe next time we can give them a try together! I know Emilie...I had not either and I will definitely do it again. They were everything I was wanting from the fried except the grease and fat! You Start Eating With Your Eyes People!